Tucson Realtor, Brian Dufault is an agent with HomeSmart in the beautiful city of Tucson, AZ. When Brian approached me to help establish his web presence, I was happy to help. After assessing Brian's needs, we decided to build his website with WordPress. 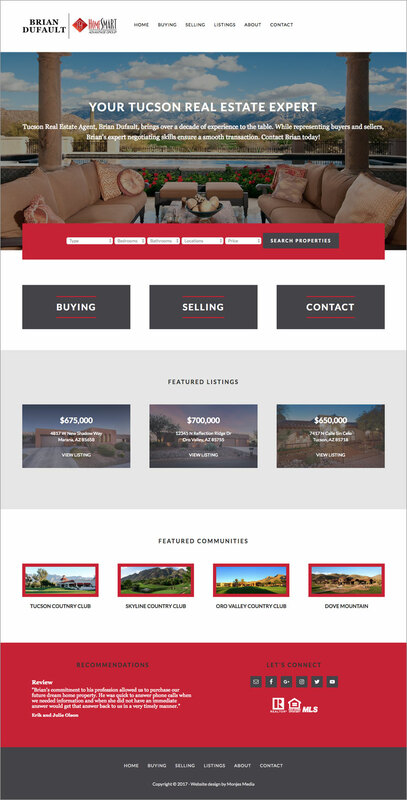 The site features responsive design, a property search as well as custom post types for featured listings and featured communities. While beautiful photography catches the eye, ease of use across all devices keeps users on the site while searching for the perfect home. Content for the interior pages will be populated shortly. IDX integration along with additional lead capture mechanisms will likely be added in the future.